Italian Greyhounds are not for everyone so if you are thinking about an Italian Greyhound adoption from our Rescue, please do your research before making the decision to make one a part of your family. If you feel that an IG or any of our other breeds up for adoption would complement your lifestyle and that you could provide the patience and love it deserves, please fill out an adoption application online. Once the Italian Greyhound Adoption application is completed and submitted for consideration, we will contact you to discuss adoption options further. References are checked and a home visit prior to adoption is required. Italian Greyhound adoption fees vary. Where may I see the pets available for adoption? ROMP Rescue is a rescue (not a shelter), so that means all of our pets are in the home of our volunteer foster families. Appointments for meet-and-greets will only be set after an adoption application has been completed and reviewed by our staff. Pets may also appear at any of our public events, check out our events page for more information on the next date and location. We do like to meet committed adoption candidates as well, feel free to swing by one of our free doggy play dates to introduce yourself as we always have ROMP volunteers (and usually some foster pups) there! Is this pet still available for adoption? Our adoptable pet page is updated daily! If you are interested in a pet with litter mates, please include a second choice as we review applications in the order they are received, and your choice may already have an application pending review. Even if an Italian Greyhound adoption (or other breed rescue adoption) is pending, we will still accept applications in the event that the first one falls through or we feel another candidate would be a better fit. What does your adoption process consist of? Interested applicants should first complete an adoption application found here. After we review the application we will send follow up questions, if necessary, for those applicants that seem to embody the qualities our rescues need. From there we complete vet, groomer and reference checks for candidates we feel are a good fit for our rescues. We will run a background check to ensure candidates do not have any convictions for neglect, abuse, or animal cruelty. If all goes well, from there we will schedule a home visit where the candidate will get to meet the pup and we will be able to not only meet the applicant but also check their home to make sure it is pet friendly and further interview the interested adopter. For candidates that pass all those procedures, we will provide an adoption contract, collect a fee and schedule a day for the furry friend to become a family member. After that point, we request all applicants have the pup visit their vet. While every effort is made to provide the best possible care once these dogs come to us, we cannot guarantee their health but are able to reverse the adoption within 7 days for a full refund if the pup is found to have any issues that were not previously disclosed. To ensure a successful adoption, we have a network of volunteers happy to answer any questions and help you work through issues that may arise while your new dog is transitioning into your home, or 10 years down the road! We are committed to each and every dog we rescue for the rest of his/her life, so please stay in touch with us, as we love getting updates! 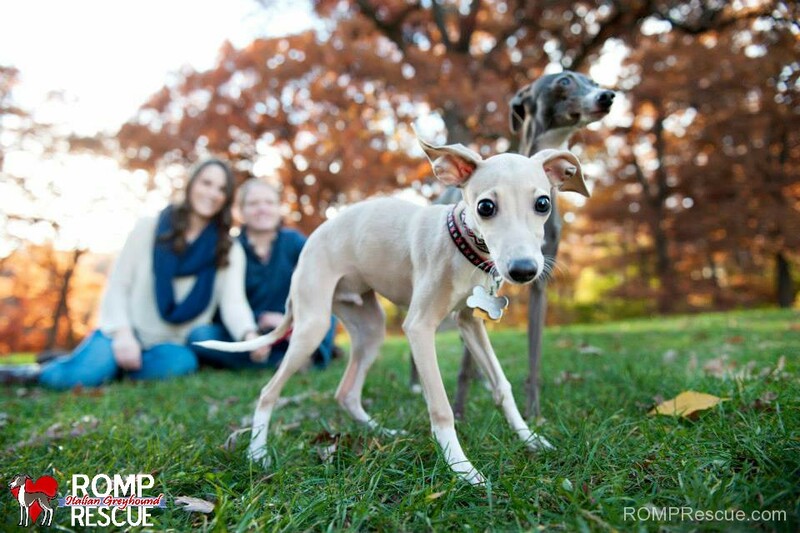 ROMP Italian Greyhound Rescue is committed to the life, health, and well-being of every dog we place for the remainder of that dog’s life. Should the adoption not work out or you need to rehome the dog, we require by contract that you make immediate contact with us and return the dog to our care. Why do I have to fill out an adoption application? ROMP Rescue puts much more than just money into our pets, they are treated as a member of their foster family and will always be part of the ROMP Rescue family. We want to ensure that the pet you want to adopt is the right fit for your family as well. It’s not just an Italian Greyhound adoption, it’s about finding the perfect lifelong companion for each pooch. Please complete the application in it’s entirely and answer all questions in great depth. Failure to do so will have your application be automatically rejected. We rely on properly completed applications in our first round of screening for potential forever homes. Families that are truly interested will go the extra mile and show it in the answers in their applications. Can I meet the pups before competing an adoption application? No. Because ALL our rescues are in the loving homes of our volunteer foster families, we do not schedule meet and greets until the adopter passes the adoption application review, follow up questions, and reference checks. You will be able to meet the pup during the home visit portion of the application process and setup another home visit with a different pup if necessary. A home visit is an in-home, pre-adoption interview. You will be visited by a ROMP Rescue volunteer, and the volunteer will usually bring the pet you are wanting to adopt. This is to verify the information provided on the adoption application as well as explain our adoption policies. It allows you, the potential forever family, to see how the pet may behave in their new environment and for us to make sure your home is pet-safe. A home visit may sound like a big production, but it really isn’t. We won’t be coming to judge how well you clean your house, and we don’t care about your decorating style. What we do care about, is whether or not your house is a safe place for a dog. An untidy garden doesn’t matter, but jagged holes in a fence that a dog could escape through, or injure himself on will. Dishes in the sink don’t matter, unless you’re hoping to adopt an overweight dog that has problems with stealing food. Clutter on the mantle won’t matter, but clutter down low could be a problem with a new puppy who may want to taste everything in sight. Part of the point of the home visit is for us to find these things together, so that your IG will be safe when s/he comes home. When we do the home visit, we prefer that all family members and pets be home, and when possible, we bring the dog with us. This way, we can get a better sense of how the dog will fit into your family and how he/she interacts with everyone in your home environment. Why do you run a background check? A thorough criminal background check is run to ensure that there are no prior convictions of abuse, neglect, animal cruelty, violence, or illegal activities with the potential adopter. Most often, our pups have been abandoned, abused and neglected. It is our responsibility to do all we can to find the best possible homes where the pups will live the remainder of their lives receiving love by law abiding families that can give them a lifelong commitment of safety, security, and provide all the necessary vetting, care, and companionship. The information is confidential and will not be shared with any individuals or organizations outside of ROMP Italian Greyhound Rescue. Why do I need a veterinary reference? We will call to check all vet references. It is important for your pet’s lifetime health that they receive their annual shots. A good relationship with your vet and good records from your current or previous pet provide peace of mind that you will give your next furry friend the care it deserves. How much is the adoption fee? Adoption fees vary based on the Italian Greyhound adoption or other pooch you are interested in, our fees typically range from $250-$350 per pet. Please keep in mind the fee only covers a portion of our investment into the care of your adopted pet. Your pet has been part of a foster home environment where they have received love, socialization and training. In addition, pets are current on all vaccinations as needed for their age unless otherwise noted, microchipped, and spayed/neutered prior to adoption (if old enough), which averages $450+ per pet. 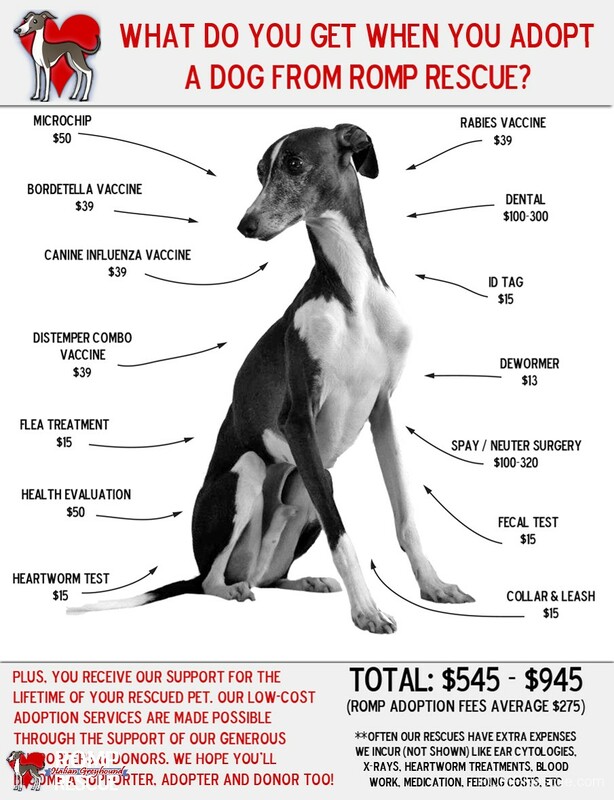 In the case of pets who have been treated for heartworm, this cost runs $300 to $600 per treatment, dentals are 100+ per pup, and all other vetting that takes place. Taking all the costs of feeding and other supplies as well, our adoption fee is really very minimal. We will never turn down a donation in addition to the adoption fee. Why are your requirements so tough? The adoption process at ROMP has been refined based on the knowledge gained over years of experience in rescue. We have received so many owner surrenders for a multitude of reasons, saved perfectly adoptable dogs from kill shelters because their owners no longer wanted them for reasons that were no fault of the dog, understand the strengths and weaknesses of the dog breeds we save and know what realistic expectations are for the rescued pups and adopters. Upon rescuing each dog, we are committed to finding them the most appropriate lifelong home, no matter how long it takes. There is a lot of time, energy, expenses and love poured into each dog at ROMP. At the end of the day, it’s all about what is right for the dogs we rescue as we want them to be well cared for, happy, healthy and with the family for the rest of their lives. Because of the rescue dogs former lives and experiences, a certain type of family would be well suited for them. Placing them with the first home that is interested in them may not be the best idea if that family is not a good fit (even though they may think they are). Although many applicants have the right intentions, they may unknowingly be able to provide the right environment for our rescues (puppies, adults, puppy mill survivors, seniors, or owner surrenders) to bloom. The pups had a rough enough start in life, though no fault of their own; we want to make sure the rest of their life is one of happiness (for both the pups and families) and do our best to make sure the dogs we rescue never have to be returned and come back to rescue. How long before I may adopt my pet? Our organization is 100% volunteer run, we do not have any paid staff. None. As such, applications are typically reviewed after 6 pm, and adoptions may take 3 weeks or longer to review depending on volunteer availability. This may seem like a long time for you, however, we want to ensure our pets are going to the best homes for them. Please be patient! From there, it is a matter of checking references and coordinating schedules for an in-home visit before completing an Italian Greyhound (or other canine) adoption. We do not have enough time to respond to every applicant but will notify those we feel are a good fit. Can ROMP hold an animal for me? No. We are unable to hold dogs for prospective adopters. If we hold an animal, that could mean the life of another animal because the number of pups we have is limited by the space they have in our foster homes. If that animal has the chance to be adopted, then we do the adoption so we can rescue another pup. If the animal is still available when you are ready to adopt, then the normal adoption process applies. Do you allow for out-of-area adoptions? Yes, we do adopt dogs to homes outside of the local area, although we prefer to adopt our dogs locally. Part of our purpose as a rescue group is to be there for families who adopt dogs, to help them with any problems or questions that might come up. We also require in our adoption contract that if the adopter ever has to give up the dog, for any reason, for the life of the dog, that the dog comes back to our rescue group. That can be difficult to accomplish when the dog is living outside of the local area. We do require a home visit to be completed before we can place a dog in a home. Distance is a factor in whether or not the required home visit can be completed. We are a 100% volunteer run organization. Although we do have volunteer contacts in many areas, some areas may be difficult for us to locate a volunteer to conduct the home visit. Furthermore, we do NOT ship our rescues, we prefer that all adoptive families travel to the Chicago area to meet their adoptive dog. Why are your pets microchipped? All pets that are rescued through ROMP Rescue are microchipped. This is a special scannable tag that is placed under the pets skin usually by their neck. It provides information when scanned so your pet can be easily returned if he/she gets lost and ends up at animal control, a veterinary office or another rescue. Many dogs get lost without collars/tags or are being dognapped and this is another measure to ensure that dogs get returned to their rightful owner. ROMP Rescues information will remain on the microchip post-adoption as to ensure if you move, change phone number, or the like we can be contacted and return the furry friend back to you! These devices are not GPS based (GPS based devices need a battery and would not be placed under the skin) so the dog will need to be captured and be scanned for a microchip when recovered to successfully be returned. Will the pet be spayed or neutered? Per Illinois state law and ROMP Rescue’s mission, ALL pets are spayed or neutered prior to adoption. If the dog is not old enough (in the case of puppies), we typically hold off adoptions until the spay/neuter can be completed which is usually between 4-6 months of age. If an adoption occurs before the spay/neuter can take place, the adopter will be contractually obligated to complete it per the ROMP Rescue adoption agreement. If the adoption isn’t working out, can I give the dog back? Not only CAN you……our contract (which you sign at the time of the adoption) states that if for ANY reason you EVER can no longer keep the dog, the dog MUST be returned to our rescue. Why is there an Italian Greyhound Rescue? Who wouldn’t want an Italian Greyhound? There are as many different reasons as there are dogs needing homes. Each dog is an individual, and they have their own personalities. If the time is taken to do research prior to committing to adoption and to train the dog properly, an Italian Greyhound can be a wonderful companion. Most of these situations are preventable. Researching the breed before adoption is crucial so that there will be no surprises later. Adopting from a rescue also allows for the adopter to understand the dogs personality before making the life long commitment, setting up realistic expectations for the adopter about the dog, and ensuring it will be mutualistically beneficial for both the dog and family. Also, please note that good training could have remedied some of the unwanted behaviors and is something that we work on with the pup while with foster homes. Here is a resource from Animal Planet with details about the breed so first time potential Iggy owners can be knowledgeable about an Italian greyhound before their adoption. Why was I not chosen as a good fit for the dog I inquired about? We have the right to deny any applicant for any reason at any point in the adoption process without explanation. Often times, it is not because the applicant won’t be a good family to a beloved pet, but they just aren’t a good match for the type of pups we have in our care. We know our applicants have good intentions but we have to make decisions based on what is best for the rescued dog and often times the applicant unknowingly does not have the right knowledge, home environment, schedule, and/or expectations for the dog they are inquiring about. We may hold onto an application and check back with the applicant to see if they are still looking for a furry family member if/when we rescue a pup that is a better fit. We submitted an application 8 days ago and were wondering if you received it and where we are in the adoption process. When we filled out the application we indicated we were interested in Crawford, but after reviewing your site again, we are interested in any of his other three siblings. As stated in our application we lost our beloved Java to cancer in February and miss him so much, it is time to get another IG. We spent months trying to get him help including the Orchard Park Annimal hospital for cancer treatments but to no avail. Please consider us favorably for adoption. Yes, we did receive your application on August 25th, thank you for the follow up. We send our deepest condolences to you and your family regarding the loss of Java. Regrettably, we are based in Chicago and require a home visit prior to adopting out one of our rescues. Due to the geographic boundary we will not be able to continue with the adoption process for your family at this time. We hope to expand our network and increase our adoption ranges in the future. We wish you the best in your search for your next family member and will let you know if any of our reps find their way in your region in the near future to conduct a home visit! I do not understand why NO one has gotten back to me on Ginger. I have written through petfinder a few times. and Romp has had my application weeks. there is not a chance my application would not have been accepted. I am much too dedicated to my pets. it has only been a little over a week since you sent in your application (it was sent in on the evening of Oct 18). It takes volunteers (which we can always use more of) and a lot of time to transport the pups, vet the dogs, review applicants, answer emails, do reference checks, conduct home visits, coordinate foster homes, fundraise, do adoption events, and more. We are doing our best and our adoption coordinator will be in touch if she feels you are a good fit for Ginger. Do realize we are a volunteer based rescue group – no one is paid. All our volunteers have full time jobs, families, and other obligations so please be patient as we are trying to find the very best homes for our rescues! I understand. I ran a 91-unit Homeowners Association for 14 years, while volunteering for the Wildlife in Need Center for rehabilitation while also working full time. I do understand but….. this many weeks and emails later? I guess I am impatient to hear because I have been trying not to search out other pups. I hope you can understand that also. This is the first response of any kind I have received from anyone. You did not fill the adoption application out in full and left several questions blank for which reason our follow-up is delayed. Our coordinator will be in touch when she finds time to highlight everything you skipped and resubmit it to you for full completion. OK thanks, I am sure 10 days is not correctly reported but that is OK. I will just look forward to hearing from her soon.